Our paper is misinterpreted — have you read it? NIWA’s raw data from each site in graphical format, showing when each adjustment was made and its magnitude. These are the facts at the heart of our paper, no matter that our critics can talk only of the opinions it expresses. Instead, they should address their attention to these facts and recognise that NIWA refused, without reason, to release the adjustment details, giving us false references that sent us on a wild-goose chase. Then they ought to ask why NIWA did this. The paper we published last November continues to attract attention. The sceptics like it since it seems to refute any warming in New Zealand and the warmists like it since it seems to present a loutish, unscientific punching bag. The truth lies more moderately somewhere in between. The sceptics shouldn’t look to our paper to refute local warming, because it doesn’t. 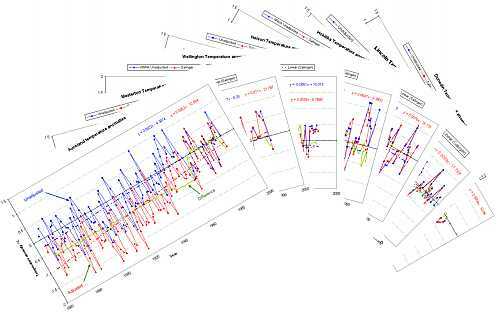 It presents no evidence on the quality of the national temperature graph — it merely questions the data, expresses strong doubts about their accuracy and wonders what adjustments were made to them. NIWA’s graph of the NZ annual temperature series. A linear trend fitted to the data over the period 1950 – 2005 is equivalent to an increase of 0.4°C over that period (or 0.3°C fitting a trend to the last 50 years, 1955 – 2005). That’s a far cry from 0.92°C over the last 100 years, which is what David Wratt last claimed. The first 50 years must have been scorching! The warmists, ripping into us and our methods with gusto, shouldn’t waste their energy refuting the paper or our methods, for the scientifically justified statements are irrefutable. If they would pause to read our paper more carefully, they will find the parts they disagree with are just a vigorous expression of opinion, nothing more. All you can do with an opinion is to have another opinion — you can’t refute a mere opinion, only an assertion of fact. The facts are mostly contained in the series of seven graphs showing the raw (monthly) data and the adjustments and of course our critics won’t argue with those, since they come straight from NIWA. Ken, a frequent visitor here, has levelled some familiar accusations at our paper. For the sake of newcomers to the argument I’m putting my response here in a new post where more people will see it. We compared raw data for each station (from NIWA’s web site) with the adjusted official data … What did we find? First, the station histories are unremarkable. There are no reasons for any large corrections. There is nothing in the station histories to warrant these adjustments and to date Dr Salinger and NIWA have not revealed why they did this. The statements about what we found in the station histories are simply true. They are not an expression of our beliefs regarding the temperature readings but an observation of the information made available by NIWA. The web site did indeed contain no indication that adjustments had even been made, much less what size they were, or why they were made. No, Ken, we graphed the data provided by NIWA to show how it has been adjusted. Anyway, informed by the simple, undeniable facts that adjustments had been made but not declared by NIWA, we expressed opinions, saying “scientists created a warming effect”, “it’s a disgrace”, and so on. These opinions are strong, but they’re valid, and the facts we outline do not refute them. They were expressed vigorously but they weren’t lies and we have nothing to apologise for. Why did we do it? We wanted the adjustments so the temperature record could have a jolly good peer review, the first one ever. We already knew that NIWA and Salinger had been refusing to disclose them for about thirty years, so we expected resistance. Most unscientific, true. Why all the fuss about Wellington altitude adjustments? NIWA’s analysis of measured temperatures uses internationally accepted techniques, including making adjustments for changes such as movement of measurement sites. For example, in Wellington, early temperature measurements were made near sea level, but in 1928 the measurement site was moved from Thorndon (3 metres above sea level) to Kelburn (125 m above sea level). The Kelburn site is on average 0.8°C cooler than Thorndon, because of the extra height above sea level. You’ll note that they don’t actually say they made these corrections in the temperature record for Wellington. It sounds as though they do, but read it again — they don’t. From an analysis of the material they referred us to, especially Salinger’s [1981?] thesis, there is good reason to suspect that this is no accident. Because I have heard on good authority that the adjustments to the NZ temperature record we have asked for are not in Salinger’s thesis. If this is confirmed, it would mean that the adjustments don’t exist in any of the citations given us by NIWA last December. So their insistence that the NZ Climate Science Coalition “has” the adjustments was false and even they didn’t have them. Why refer us to the wrong documents? On the same good authority, Salinger’s thesis doesn’t mention Wellington. So why did David Wratt make that huge fuss about the altitude adjustments between Kelburn and the airport? NIWA referred us to documents where we would find, they said, the methodology that would produce the adjustments, knowing that we hadn’t asked for the methodology, and knowing that the methodology is not so precisely defined that anyone could replicate anyone else’s results — there are just too many subjective decisions to make. NIWA referred us to documents which contained the adjustments we asked for. Those documents did not contain them. NIWA acted falsely. Those apologists for NIWA who complain about our paper smearing the reputations of their scientists should reflect on this: that these changes were made in secret, are still, today, undisclosed (Hokitika has apparently been fully described, but we have not finished checking it) and, by NIWA’s own admission, these changes introduce warming to raw data that show no warming and NIWA have refused requests for them from bona fide scientists for decades. That really is a disgrace. By any scientific standards, those adjustments should be double-checked — even triple-checked — fully described and disclosed to any competent scientist who asks for them. It is unacceptable for these important adjustments to the national temperature record to be hidden from the New Zealand public, unacceptable to complain about being asked for them, unacceptable to criticise those who ask and inexcusable to actively obstruct them by giving false citations. It is good news indeed that NIWA are reconstructing the schedule of adjustments. We can’t wait to see the rest of them. At last, Richard an acknowledgment that my statements were correct – after several times trying to deny them. and of course you went on to produce graphs ignoring the real site effects (Even you now acknowledge that there are site effects and adjustments are necessary – as does your mate conspiracy theorist Ian Wishart). Ethically you should stop trying to excuse yourself and just admit they were wrong. And apologise. The fact is that this report, issued through conspiracy theorist Ian Wishart, has been used to make extreme and unwarranted attacks on our honest scientists. You should take responsibility for that. The fact that you refuse to does imply that perhaps that was your intention. Certainly the timing does. You have denied requests for the information on the methodology used in your paper, or even the spreadsheet used. My initial analysis (yes I have had to scan and extract information from the graphs) indicates something is wrong. Either not all the data you used is the same as on the NIWA database or some arbitrary (and possibly faulty) method was used to calculate anomalies. I particular a different baseline appears to have been used in recent times. Now, if you had been transparent and released this information one could easily check. As it is there is no way of checking that the data you used is the same as that on the NIWA database. Of course, I will pursue this and report my findings in due time. But, your denial of any description of methodology or release of the spreadsheet, together with you claim that the “science team” involved wish to remain anonymous does make one suspicious, doesn’t it. Despite your denial, I don’t think you actually feel confident in the analysis used in this discredited report. And taking up your point about NIWA not releasing information – pots and kettles! Not quite. NIWA is a public agency bound by at least the Official Information Act and the Public Records Act and are obliged to collect, store and disseminate information for public use. NIWA has no right to refuse our request. However, we refused your request on the grounds that you weren’t being honest with us when you claimed you had reconstructed NIWA’s adjustments. Anyway, there is no information to “disclose” to you. There’s nothing in our report that does not come from NIWA, except for our graph of combined unadjusted temperatures, since there are various ways to construct it. Not that it’s important, it’s just there for an overview — the individual graphs show the actual temperature readings (anomalies) before and after the adjustments, both of which come from NIWA, one of which you can get from their web site. If you want NIWA’s adjusted data, ask NIWA for it, see what they say. Make sure you come back here and tell us their response! The data from the web site confirms NIWA made adjustments without declaring what they are. The graphs we provide in our paper confirm that NIWA produced a warming trend which had not been present. If you want to check what we’ve done, get the data, graph it and compare with ours. Simple. there is no way of checking that the data you used is the same as that on the NIWA database. Yes there is, just compare your graphs with ours. But you must at least try to download the data yourself. Of course, you don’t have Salinger’s adjusted data. What a shame. Where can you get it? I know — you can ask NIWA for it! We did. Analysis? Here’s our analysis: NIWA made changes to these raw data; what are they? Richard could you reference your claim that your graphs a just thecraw data from NIWA? I can’t find any such graph. Only plots of “anomalies”. Logically one should be ablec to recalculate the raw data by adding a constant baseline value. This is not the case for your graphs. In some cases a larger baseline value has been used in recent times. At least that is what my analysis is showing. Either the data you used is not exactly the same as on the NIWA database in all cases, or some funny sort of adjustments have been carried out by your anonymous “scientific team”. Either way it does raise questions about the competency of the people who constructed those graphs. Granted, you are under no legal obligation to reveal your methods or adjustments. Bit surely there is an ethical obligation. Your denial raises questions about your motives and procedures. By the way, as well as the data in your figures not coming “straight from NIWA (they are not unadjusted temperature values) they are also not monthly values as you claim. The analysis continues and I will report my conclusions in due course. Ken, I said we graph the anomalies. You raise some interesting points that I’ll enquire about. I clarified our analysis for you. What is your response? Have you asked NIWA for the adjusted data? The anomalies are not the raw data as you claimed – this has bee adjusted by subtracting a baseline value. So, without the baseline values I cannot compare your data with that I have downloaded from the NIWA database. My question has always been about methodologies. How do you determine a baseline value if you don’t take site effects into account. Your methods seem suspect to me as the baseline values seem to increase arbritarily at recent times in some cases, or else the data you used is different in some cases to that I downloaded from NIWA. I can appreciate you don’t have an easy understanding if the scientific issues. You should’t be obliged to defend work you did not do.